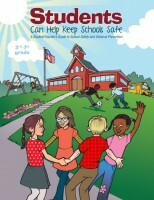 After 15 months in production Students Can Help Keep Schools Safe will be released in March by West Bow Press. This book is the second in my school violence prevention series. The Bad Guys was the first book, The Bad Guys is for readers in preschool to 3rd grade. 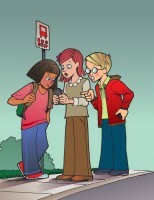 Students Can Help Keep Schools Safe is for students in grades 3-8th. A special thank you to my wonderful illustrators Andrea Hofmann and Benjamin Hummel they really brought my project to life. They worked tirelessly to make sure everything was, “just so.” We children’s authors are nothing without our illustrators. Thank you Andrea and Benjamin your work is much appreciated! My hope is that this book will save lives. I believe if children and parents are educated about school violence, school violence will decrease. I really believe it can be that simple. All I need now is a Twitter expert to help make this happen. A Twitter expert in my mind is a teenager. They can Twitter and market from their phone during passing period at school with little if any effort. Ahh, they make it look so easy. Not so says the middle-aged children’s author. I gave birth to this project on December 24, 2012, two weeks after the Sandy Hook shootings. My heart was grieving for the Newtown, CT. community and the families. I feel so much better now knowing that I tried to help a problem that is completely out of control. Will you join me on my quest to reclaim the public schools? I would love to start running a Twitter internship for willing youth, while I simultaneously shutdown school violence.